The dean of the Faculty of Business Administration, Eric Rodríguez, was presented with an award. 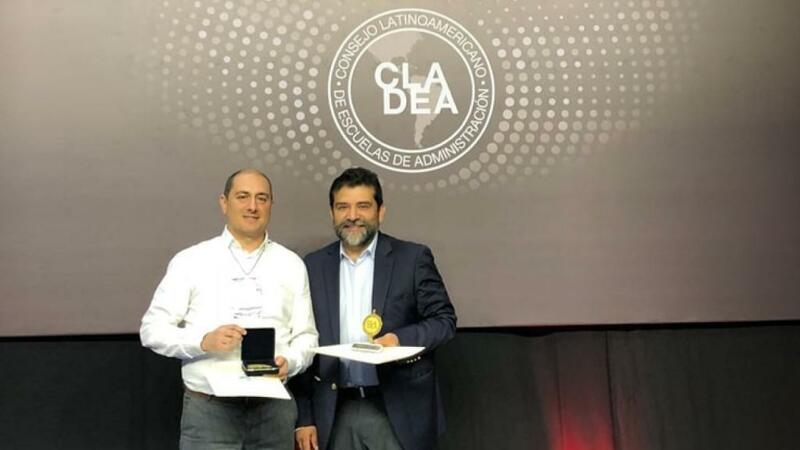 The Faculty of Administration at the Universidad de los Andes was highly recognized by the 2018 Latin American Council of Management Schools Awards (CLADEA) as it was awarded first and second place in the Latin America initiatives sustainability category for entrepreneurship and innovation. The winning projects were: in first place, RedES-CAR (Network of Sustainable Companies), presented by professor Bart van Hoof; and, in second place, the Young Colombian Leadership Network, the academic coordination of which has been under Jesús Muñoz and Andrés Novella´s leadership. The first is an initiative of the Regional Autonomous Corporation of Cundinamarca which worked together with academic institutions such as the Faculty of Administration. It looks to strengthen SMEs in the supply chain, helping them to transform positively through sustainable production. The Young Colombian Leadership Network is an educative program that seeks to strengthen and empower young people so they can develop their leadership skills that will allow them to be drivers of progress in society. It is currently supported by different academic institutions. Both RedES-CAR and the Young Colombian Leadership Network are highly important projects born from public-private alliances that focused on generating a positive impact on Colombian society and are the result of multiple efforts from the Faculty of Business Administration in terms of research into sustainable development. The Faculty was recently reaccredited by EQUIS, which is one of the three most prestigious global accreditations that evaluates the quality of education in Business Administration schools for a maximum five-year period. It was presented with the award particularly for the progressive advances it has made in sustainable development, its consolidation of responsible leadership skills, and its commitment to a culture of continuous improvement that is based on four of the Faculty’s characteristics: academic excellence, internationalization, the joint construction of knowledge with organizations, and supporting student and alumni initiatives. The CLADEA Awards 2018 were held at the Universidad del Norte in Barranquilla on August 27th. Eric Rodríguez, dean of the Faculty, and Andrés Novella, director of Executive Education Open Programs, represented the Faculty at the event and received the awards.